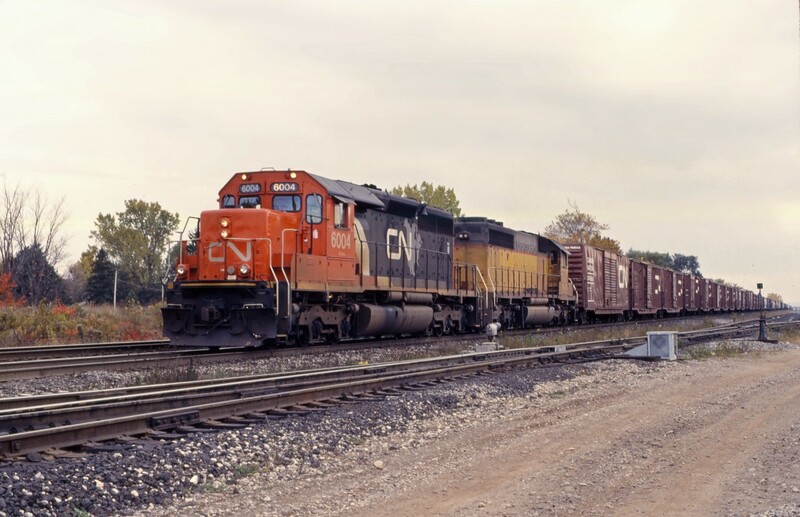 Railpictures.ca - Doug Page Photo: In the early 1990s, CN embarked on a program to rebuild its SD40 fleet and supplemented this with the acquisition of used SD40-2s no longer required by Union Pacific. Here we have one of each, SD40u 6004 (rebuilt from CN 5079 at Pointe St. Charles shop, Montreal in 1993) and 6094 (ex UP 4094, MP 3094 and 794; eventually rebuilt into the CN 5372). The train is about to work the yard at Aldershot East. | Railpictures.ca – Canadian Railway Photography – photographie ferroviaire Canadienne. Caption: In the early 1990s, CN embarked on a program to rebuild its SD40 fleet and supplemented this with the acquisition of used SD40-2s no longer required by Union Pacific. Here we have one of each, SD40u 6004 (rebuilt from CN 5079 at Pointe St. Charles shop, Montreal in 1993) and 6094 (ex UP 4094, MP 3094 and 794; eventually rebuilt into the CN 5372). The train is about to work the yard at Aldershot East.